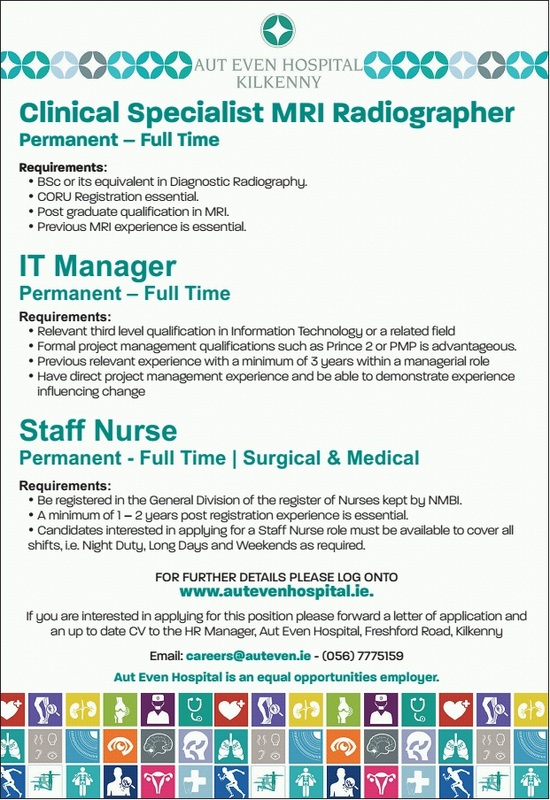 Leading hospital, Aut Even, is looking to fill the following, key roles and invite applications from suitably qualified professionals for the key positions. BSc or its equivalent in Diagnostic Radiography. Post graduate qualification in MRI. Formal project management qualifications such as Prince 2 or PMP is advantageous. Be registered in the General Division of the register of Nurses kept by NMBI. A minimum of 1 – 2 years post registration experience is essential. Candidates interested in applying for a Staff Nurse role must be available to cover all shifts, i.e. Night Duty, Long Days and Weekends as required.